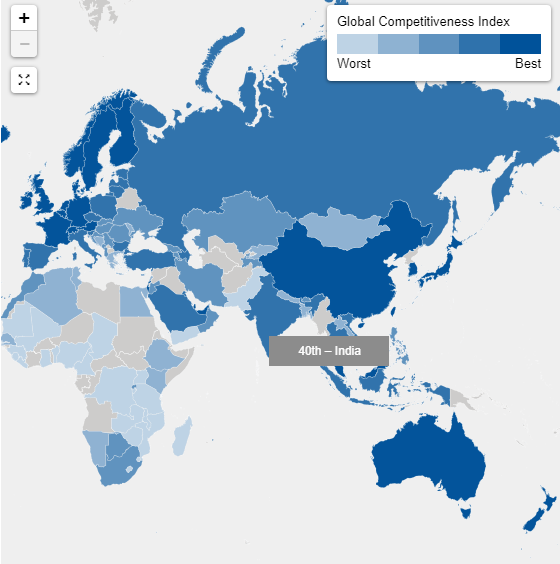 Featuring the Global Competitiveness Index, the Report assesses the competitiveness landscape of 137 economies, providing unique insight into the drivers of their productivity and prosperity. The Global Competitiveness Index report, which is prepared every year by the World Economic Forum ranks India 40th, out of the included 137 countries. This report is dependable as it’s prepared keeping in mind the overall development of a country based on twelve key points. These twelve points fall into three main categories. Namely, Basic requirements, Efficiency enhancers and Innovation & sophistication factors. We will look at these, one category at a time and compare them with the Global Competitiveness Index report of 2015. India has climbed 5 ranks in 2017. In 2015, India was ranked 55 and now it ranks 40. Which is always better but the seeing the trend of past years this jump is not phenomenal, only natural. India ranks 53/137 in Judicial independence and the trend seems to fall continuously. So we can expect a lower rank in the future years if the condition does not improve. It also ranks 117/137 in business costs of terrorism and 26/137 in Favoritism relating to decisions of the government officials. That justifies the oppression of the media by the Indian government and the recent firing of journalist Punya Prasun Bajpai and Network Managing Editor Milind Khandekar. Institutions are the fundamental pillars of any society. When we fail to keep corruption out of these institutions we fail as a country and the future is doomed to darkness. India’s mobile phone industry is on the boom and that only reflects the decline in landline phones, hence ranking India 111/137, which is generally not an issue. The railway’s infrastructure is also on the rise but the trend seems to be having to be a sinusoidal wave. Where the percentage change in inflation is stagnant, it should ideally be going down. Government’s debt in percentage of GDP has significantly increased. India scores 101/137 in government debt. Government budget balance is scored at negative -6.6, though it is better than the 2015 report of -7.2, its clear even to a layman, that it’s not good for the economy. Where the trend in Malaria incidence is dropping. The trend in Tuberculosis has witnessed an alarmingly steep increase, with India falling three ranks down to 116. HIV prevalence seems to be stagnant. Where Primary enrollment rate is on a decline, the quality of primary education has improved. Seeing the work of Delhi government in enhancing the infrastructure of its Government Schools, it is apparent that it can motivate or generate competition in other governments too. We can hope that the primary education environment and enrollment will see a significant increase. Next week we study and compare the Efficiency enhancers category and review India’s report card.